The Idlib Health Directorate recently opened a new hospital in the village of Qalb Lawza in the Jabal al-Summaq area of north Idlib countryside. What is the story behind this project? For context, Qalb Lawza is one of the originally Druze villages of Jabal al-Summaq. In early 2015, under the rule and coercion of Jabhat al-Nusra, the remaining original inhabitants of the village and the other Druze villages in the area announced for the second time conversion to Sunni Islam. Qalb Lawza was the site of an infamous massacre of villagers at the hands of members of Jabhat al-Nusra in June 2015 in a dispute over confiscation of land and property. At the time, I listed 23 villagers who were killed in the massacre. However, according to a resident of Qalb Lawza, there were a further 8 people missing and it later transpired that they had been killed at the time of the massacre, bringing the total number of slain villagers to 31. At present, according to the head of the Qalb Lawza local council, 118 families of the original inhabitants remain, while 75 families of displaced persons have come to the village. Within that figure of 75 families of displaced persons are counted 30 families of Uyghur origin, who were settled in Qalb Lawza through Jabhat al-Nusra's control of the village. Currently, as is the case with the Jabal al-Summaq area, the village is controlled by Hay'at Tahrir al-Sham, a successor to Jabhat al-Nusra. Though Qalb Lawza was also named Qalb al-Islam by Jabhat al-Nusra at one point, that name does not appear to have caught on. The purpose of the new hospital is to provide medical services to the inhabitants of Jabal al-Summaq, who otherwise lack easy and quick access to such services. The project has its origins in a Western aid organization. Abd al-Majeed Sharif, the former head of the local council in Kaftin (one of the villages of Jabal al-Summaq), said that he heard that the project was "offered by an American organization through the mediation of Sheikh Amin Tarif [sic: Muwaffaq Tarif, spiritual head of the Druze in Israel] of the Druze of Palestine." However, the general consensus from sources is that the project was supported by a German aid organization, which was identified as GIZ by the head of the Qalb Lawza local council, which currently has three members, all of whom are from the village. The main controversy that exists regarding the project is the choice of location and the decision-making behind the project. Specifically, a resident of Kaftin and a resident of Qalb Lawza allege that the United Mountain Council (مجلس الجبل الموحد) tried to move the project away from Qalb Lawza but failed. For context, the United Mountain Council, which has publicly proclaimed support for the Qalb Lawza hospital, is a local council body formed with the aim of uniting the local councils in the mountain of Jabal al-Summaq. The United Mountain Council is led by Abd al-Salam Qarmo, who was once in Ahrar al-Sham. Abd al-Salam Qarmo comes from the Qarmo family, an originally Sunni family that came a long time ago to Jabal al-Summaq. Abd al-Salam Qarmo thinks that the Qarmo family may ultimately be of Kurdish origin, though he does not profess to know the family history so well. Readers may remember that previously I documented claims of problems between the Qarmo family and inhabitants of Jabal al-Summaq of Druze origin. In Bashanad-Laya, for example, there were claims that members of the Qarmo family were preventing villagers from using the village well and transgressing against their property. In a similar vein, for critics in Jabal al-Summaq, the United Mountain Council is seen as largely representing the interests of the Qarmo family. According to Abd al-Salam Qarmo, the United Mountain Council is currently affiliated with the Salvation Government, which is supported by Hay'at Tahrir al-Sham. As he put it more broadly, "You know the area. All of it and [sic: or] most of it, if not affiliated with the Salvation Government, is supportive of the government or works by orders of the Salvation Government." He explained that the United Mountain Council's origins go back to the village of Kafr Kayla (where the Qarmo family is largely based), as the Kafr Kayla council established relations with the aid organization GOAL to provide aid for five villages with a representative of the council for each village. However, on account of unspecified "problems" that arose in Kafr Kayla, Abd al-Salam Qarmo was forced to abandon the council, while the representatives in the other villages also abandoned the council. These events, Abd al-Salam Qarmo explained, occurred within the time frame of mid-2015 to 2016. He claims that in 2017 though, people of the village came to his house and insisted that he return to the Kafr Kayla council. He did so. Subsequently, a unifying project for councils in the villages of the mountain of Jabal al-Summaq was set up, and thus the United Mountain Council was born. In theory, in each village the council should have a representative who is the head of the local council in his village. In total, the United Mountain Council claims to represent nine villages in Jabal al-Summaq. Conversely, the head of the local council in Qalb Lawza says that his council used to be affiliated with the United Mountain Council, but is now independent, as the United Mountain Council has not offered the necessary support. Abd al-Salam Qarmo denies that the United Mountain Council attempted to move the new hospital away from Qalb Lawza: "Had we wanted to change the location, we could have done so. I have no interest in changing the location, and we do not have a more suitable location." According to Abd al-Salam Qarmo, the hospital is a mobile hospital intended to help the people of Jabal al-Summaq. The original idea was to host the hospital in Iraq. However, the Iraqi government rejected the idea, and so the proposal was transferred to the Idlib Heath Directorate, which then visited Qalb Lawza and connected with the Qalb Lawza representative of the United Mountain Council, which then visited the Idlib Health Directorate to come to an agreement on the matter. The agreement was that the Idlib Health Directorate would secure the medical staff, while the United Mountain Council would primarily secure protection of the site. Abd al-Salam Qarmo claims that the United Mountain Council delegated its Qalb Lawza representative to engage in subsequent dealing with the Idlib Health Directorate, granting him autonomy for ease of work. 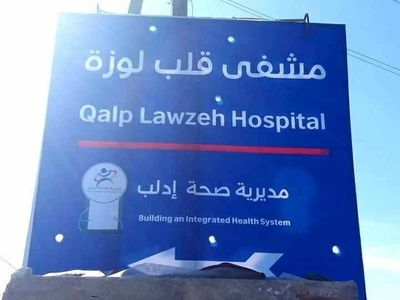 However, a medical source in the Qalb Lawza local council who is also working in the new hospital denied that the United Mountain Council had a role in choosing the location of the hospital or coordinating with the Idlib Health Directorate on the matter. Rather, according to this account, the project was a matter of coordination between the Idlib Health Directorate and GIZ. "We are an independent civilian institution concerned with offering medical care to civilians regardless of their ethnicity or sect." The medical source from the Qalb Lawza local council likewise affirmed that the Idlib Health Directorate is independent, but may work with the Interim Government or Salvation Government. There are also some claims that Abu Qatada al-Iraqi, a Hay'at Tahrir al-Sham official, worked to ensure the hospital remained in Qalb Lawza. Readers may remember that Abu Qatada al-Iraqi was at one point proclaimed to be the Jabhat al-Nusra amir of the Jabal al-Summaq area though that proclamation turned out to be erroneous (note that the current Hay'at Tahrir al-Sham amir for the area is one Abu Muhammad al-Russi, who is from Idlib). It turns out that despite his kunya, he is actually from Deir az-Zor, and he currently resides in Qalb Lawza. However, the general consensus of sources denies that he had a role in the hospital project. On its social media, the Idlib Health Directorate advertised recruitment procedures for the Qalb Lawza hospital. It would appear that the Idlib Health Directorate drew heavily on personnel displaced from East Ghouta in Damascus. The medical source from the Qalb Lawza local council estimates that there some 25 staff working in the hospital, and he is the only staff member from Jabal al-Summaq. Finally, the services the hospital intends to offer are supposed to be free, even for the Uyghurs and other muhajireen who have settled in the area. What is the broader conclusion that should be be drawn from the story behind the new hospital in Qalb Lawza? Despite the fact that Qalb Lawza is in an area under Hay'at Tahrir al-Sham control, it does not follow that the organization and the linked Salvation Government provide comprehensive services or manage every civil society project in the area. Indeed, the Hay'at Tahrir al-Sham-linked Iba' News Network, which only recently covered issues of water scarcity in Jabal al-Summaq and often covers civil society matters, has so far said nothing about the opening of the hospital in Qalb Lawza, perhaps indicating the lack of the involvement of Hay'at Tahrir al-Sham and the Salvation Government in the project. The main purpose of Hay'at Tahrir al-Sham, which controls Idlib's most important assets and can thus be seen as dominant in the province, has always been to act as a military and administrative unifier for the insurgency. This approach was articulated yet again in an interview al-Jazeera conducted with Hay'at Tahrir al-Sham political official Yousef al-Hajar. Even so, it is clear that Hay'at Tahrir al-Sham is far from realizing these goals of unity. Indeed, the Salvation Government's capabilities are highly questionable. For his part, Abd al-Salam Qarmo said that the Salvation Government was trying to undertake projects in the Jabal al-Summaq area through aid organizations. However, as the medical source in the Qalb Lawza local council put it: "The Salvation Government does not enjoy any type of support. It was appointed by the Jabha [i.e. Hay'at Tahrir al-Sham] and I expect that it will be dissolved soon." Similarly, the head of the local council in Ma'arat al-Ikhwan, another of the Jabal al-Summaq villages, pointed out that his council used to be affiliated with the Idlib Provincial Council tied to the Interim Government but then became affiliated with the Salvation Government. However, he noted when I spoke with him in May 2018 that the Salvation Government had not offered any meaningful help to the local council, and that there were only promises. In part, these challenges for Hay'at Tahrir al-Sham and the Salvation Government in administration are tied to a predictable problem facing Hay'at Tahrir al-Sham and those associated with it: namely, the group's general international pariah status as it is perceived to be a terrorist organization, something that has only been reinforced by the recent U.S. terrorist designation of Hay'at Tahrir al-Sham. The designation portrayed Hay'at Tahrir al-Sham as simply an alias of Jabhat al-Nusra, arguing that Jabhat al-Nusra created Hay'at Tahrir al-Sham "as a vehicle to advance its position in the Syrian uprising and to further its own goals as an al-Qa'ida affiliate." In other words, the U.S. considers Hay'at Tahrir al-Sham to be an al-Qa'ida affiliate, even though the group itself argues that it has wholly broken its ties with al-Qa'ida. Regardless of the finer details of the dispute between Hay'at Tahrir al-Sham and al-Qa'ida, the designation reinforces the blacklisting of Hay'at Tahrir al-Sham and its associates in the eyes of western aid organizations in particular. Thus, even as Hay'at Tahrir al-Sham wants to unify administration of the 'liberated' areas, trying to play a role in aid and development projects even in areas it controls can be highly problematic for the group. In any case, the humanitarian needs of the people living in Jabal al-Summaq and the wider area should not be ignored. Providing assistance to the Jabal al-Summaq area should not be predicated on notions of 'countering extremism': the inhabitants deserve help simply because they need it. Projects such as the Qalb Lawza hospital and efforts to expand their capabilities on purely humanitarian terms should thus be commended.